For other uses, see Caddo (disambiguation). 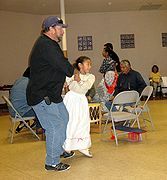 The Caddo Nation is a confederacy of several Southeastern Native American tribes. Their ancestors historically inhabited much of what is now East Texas, Louisiana, and portions of southern Arkansas and Oklahoma. They were descendants of the Caddoan Mississippian culture that constructed huge earthwork mounds at several sites in this territory. In the early 19th century, Caddo people were forced to a reservation in Texas; they were removed to Indian Territory in 1859. Today, the Caddo Nation of Oklahoma is a federally recognized tribe with its capital at Binger, Oklahoma. Descendants of the historic Caddo tribes, with documentation of at least ​1⁄16 ancestry, are eligible to enroll as members in the Caddo Nation. The several Caddo languages have converged into a single language. The tribe operates its own housing authority and issues its own tribal vehicle tags. It also operates an administrative center, dance grounds, several community centers, the Caddo Nation Heritage Museum, and an active NAGPRA office, located south of Binger. As of 2012, 5,757 people are enrolled in the nation, with 3,044 living within the state of Oklahoma. Individuals are required to document at least 1/16 Caddo ancestry in order to enroll as citizens. Fort Cobb Representative Maureen Owings. The Caddo are thought to be an extension of Woodland period peoples, the Fourche Maline and Mossy Grove cultures, whose members were living in the area of Arkansas, Louisiana, Oklahoma, and Texas between 200 BCE and 800 CE. The Wichita and Pawnee are related to the Caddo, as both tribes speak Caddoan languages. Caddo turkey dance, Caddo National Complex, Binger, Oklahoma, 2000: The turkey dance relays Caddo history. Most of the Caddo historically lived in the Piney Woods ecoregion of the United States, divided among the state regions of East Texas, southern Arkansas, western Louisiana, and southeastern Oklahoma. This region extends up to the foothills of the Ozarks. The Piney Woods are a dense forest of deciduous and pinophyta flora covering rolling hills, steep river valleys, and intermittent wetlands called " bayous". Caddo people primarily settled near the Caddo River. The Caddo people had a diet based on cultivated crops, particularly maize (corn), but also sunflower, pumpkins, and squash. These foods held cultural significance, as did wild turkeys. They hunted and gathered wild plants, as well. The Caddo first encountered Europeans and Africans in 1541 when the Spanish Hernando de Soto Expedition came through their lands. De Soto's force had a violent clash with one band of Caddo Indians, the Tula people, near present-day Caddo Gap, Arkansas. This historic event has been marked by the modern town with a monument. French traders built forts with trading posts near Caddo villages, that already were important hubs in the Great Plains trading network. These stations attracted more French and other European settlers. Among such settlements are the present-day communities of Elysian Fields and Nacogdoches, Texas, and Natchitoches, Louisiana. In the latter two towns, early explorers and settlers kept the original Caddo names of the villages. In the late 19th century, the Caddo took up the Ghost Dance religion, which was widespread among American Indian nations in the West. John Wilson, a Caddo- Lenape medicine man who spoke only Caddo, was an influential leader in the Ghost Dance. In 1880, Wilson became a peyote roadman. The tribe had known the Half Moon peyote ceremony, but Wilson introduced the Big Moon ceremony to them. The Caddo tribe remains very active in the Native American Church today. Congress passed the Dawes Act to promote assimilation of tribes in Indian Territory. It authorized distribution of tribal communal landholdings into allotments for individual households in order for them to establish subsistence family farms along the European-American model. Any tribal lands remaining after such allotments were to be declared "surplus" and sold, including to non-Native Americans. The allotment system was intended to extinguish tribal Native American land claims to enable admission of Oklahoma as a state and assimilate Native Americans into the majority culture. At the same time, tribal governments were to be ended. The territory had already been settled by numerous European Americans outside the tribal territories. The Caddo vigorously opposed allotment. Whitebread, a Caddo leader, said, "because of their peaceful lives and friendship to the white man, and through their ignorance were not consulted, and have been ignored and stuck away in a corner and allowed to exist by sufferance." Tribal governments were dismantled at this time, and Native Americans were expected to act as state and US citizens. After some period, the adverse effects of these changes were recognized. The Caddo and other Native American peoples suffered greatly from the disruption of the loss of their lands and breakup of their traditional cultures. In July 2016, Tamara M. Francis was re-elected as the Chairman of the Caddo Nation. The Council consists of Chairman Francis, Vice Chairman Carol D. Ross, Acting Secretary Philip Martin, Treasurer Marilyn McDonald, Oklahoma City Representative Jennifer Wilson, Binger Representative Marilyn Threlkeld, Fort Cobb Representative Maureen Owings. ^ "Enrollment". Caddo Nation. Retrieved 21 March 2017. ^ a b 2011 Oklahoma Indian Nations Pocket Pictorial Directory. Archived May 12, 2012, at the Wayback Machine Oklahoma Indian Affairs Commission. 2011: 7. Retrieved 2 January 2012. ^ a b c "Tejas-Caddo Fundamentals-Caddo Timeline". Retrieved 2010-02-04. ^ a b c d e Meredith, Howard. "Caddo (Kadohadacho)," Encyclopedia of Oklahoma History and Culture, Oklahoma Historical Society, Accessed July 9, 2015. ^ Peter Kastor, The Nation's Crucible: The Louisiana Purchase and the Creation of America,(New Haven: Yale University Press, 2004) 159-160. ^ J.W. Wilbarger, Indian Depredations in Texas: Choctaw Tom Fort Tours http://www.forttours.com/pages/choctawtom.asp. ^ "Art on the Prairies". All About Shoes. Bata Shoe Museum. 2006. Retrieved 26 July 2015. Fford, Cressida, Jane Hubert, and Paul Turnbull. The Dead and their Possessions: Repatriation in Principle, Policy and Practice, New York: Routledge, 2004. ISBN 978-0-415-34449-4. Wikimedia Commons has media related to Caddo.